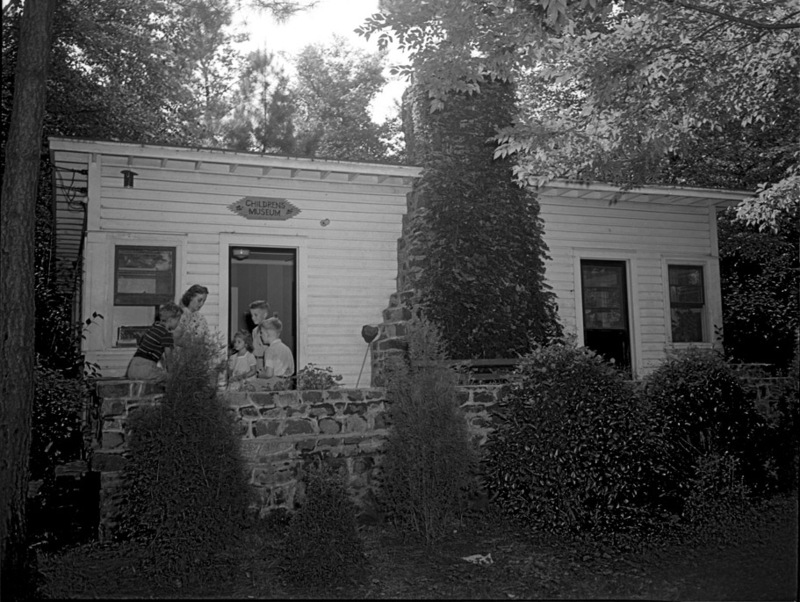 Built in the 1930s for park ranger use, the so-called Lavender House in Northgate Park was the mid-1940s home of the Durham Children's Museum, before it moved to larger quarters and eventually became the Museum of Life and Science. Long used for storage, the wooden frame was demolished after repeated flooding in 2014, with the stonework left behind as a kind of memorial. I have always wondered about that odd little place, and wondered if it's at particular risk of flooding. Drive by, and you'll see what I mean. "I was delighted to discover that the original building is still standing in Northgate Park". Isn't it nice to get a pleasant surprise? It appears the structure itself is older. Perhaps a WPA or other Depression-era project? It has that craftsman-campy appearance that typifies their work. Additionally, there appears to be a mature growth of ivy on the chimney in the 1946 picture. I lived in the neighborhood in the '60's-'70's, and its uniqueness stood out then. 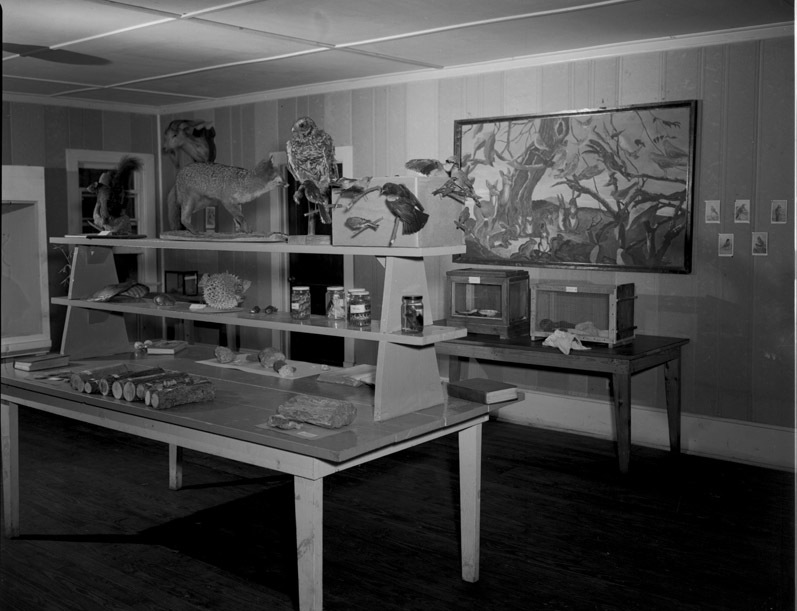 In the late 40s/early 50s the Museum had an exhibit of small (2-3 feet) live alligators in a small fenced pond on the left side of the house. 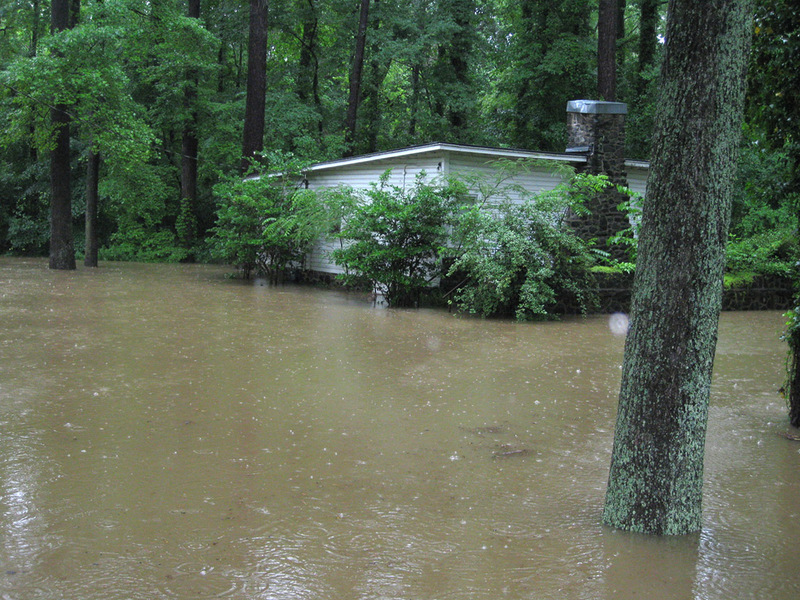 During a particularly bad storm the pond was flooded and the alligators made their way into Ellerbe Creek. reminds me of that weird building in Duke Park at the end of Acadia St (I'm sure someone here knows whether it's used by Parks & Rec, NCDOT, or other). I always thought my dad made up that story about the alligators in Ellerbe Creek. The house became a youth center after the museum moved. Years later another building was built for that purpose across the street. It burned in the 70s and was replaced by present-day tennis courts. I assume Parks and Rec controls it, which means the maintenance budget has likely been minimal over the years (see Duke Park Bath House). The city is currently using the building for "storage." I must assume this is somewhat like they use(d) the Duke Park bathhouse building for "storage." (Wonder whose water bills are in this one?) Several folks have inquired about the possibility of it - or its use in perpetuity - being donated to ECWA for office & programming space, but I'm told the building has a terrible mold problem, which isn't surprising given its location in a flood plain and the lack of attention/maintenance provided to it over the years. Most likely it will be left to rot away and then removed after the next large flood that causes visible damage. Demolition by neglect, public-style. When I moved into a house two doors down from this one in 2004, tennants/renters lived there. They were often outside grilling fish on their barbecue cookers. They moved on and it was abandoned for a bit before being used by the city for storage. My next door neighbor at the time had lived in Northgate Park since the 1950s and she said a community center that had been where the tennis courts are now was burned down in a "race riot" in the early seventies. Can the "race riot" statement above be confirmed? Perhaps someone with access to Herald-Sun archives? I lived in the Northgate area at that time and have no recollection of the fire being connected to any racial strife. CG refers to the Barfield Youth Center which burned in the early 1970's. It was a place for people -adults and children- to hold parties. I lived in the neighborhood at that time, and I don't recall anything about a race riot in the area. However, I do clearly recall its burning and walking around it the next day on my way home from school. The brick walls stood for a while until they were torn down. The bare concrete floor was left vacant for a while and later became the floor to the now present tennis courts. There was a wealthy (for his day and location) man named Barfield who lived in the large yellow brick house still standing at the corner of Farthing and Club Boulevard. Not sure of his connection, if any. Yeah, I certainly understand how historical works, or doesn't. The late Mrs. X probably misremembered the situation. If I recall correctly, Frank Barfield was the "colorful philanthropist" and tobacco auctioneer who developed Northgate Park. He and his family lived at 101 W Club (the house mentioned by Batman). He died at 60 of cirrhosis of the liver, complicated by diabetes mellitus July 13, 1952. I also notice that the door on the left side of this building was removed. Does anyone have any details about when and WHY (for the love of God) anyone would invest in such a renovation? My uncle and aunt lived in that house for many years. And yes, they were flooded out many times! "race riot" ? No It was struck by lighting and that is how it caught fire. Hey, Batman, Do we know each other? I lived at 2407 Shenandoah. Played all around there from '54. Did you live near Ricky Maisto? This is Batman, but someone else snagged my handle. I may not be a contemporary of yours; I don't know the Maisto gentleman, and I knew everyone. :) I was roaming the neighborhood late '60's through the mid/late '70's. 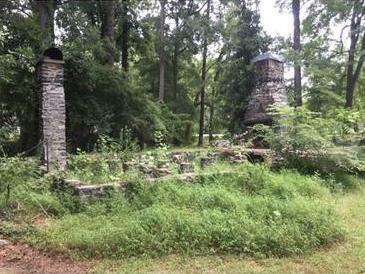 The building was dismantled in June/July of 2014 leaving only the stone foundation and chimneys. Neighborhood residents tried to resurrect it for a number of community purposes in teh year or so leading up to demolition, but its position in the flood plain prohibited any renovations or commercial use. Residents did stage a brief art show before the demolition, including the painting of bluebirds on the exterior. Perhaps someone has a picture? Children's Museum, Northgate Park at West Lavender Ave., 07.09.46. The denizens of Northgate Park are celebrating their park's 70th anniversary this week, and thus I'll pop a bit farther west to highlight the original Children's Museum in Northgate Park. The origins of the Museum of Life and Science began with the establishment of a small children's museum on Lavender Avenue in Northgate Park. 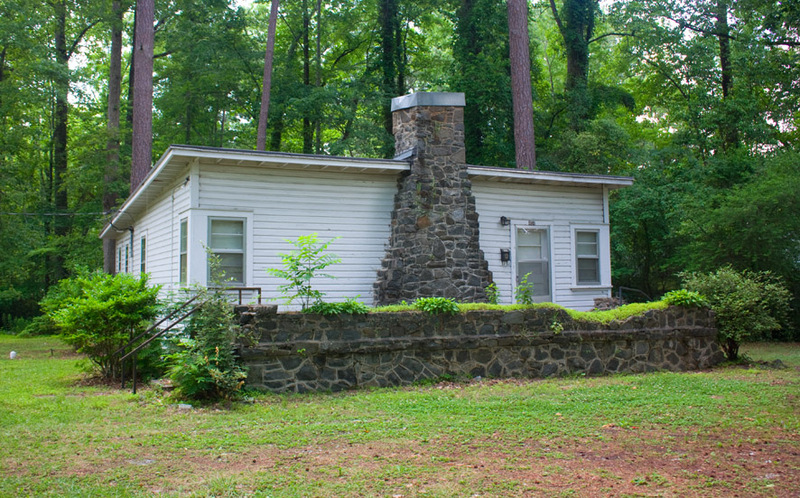 Reports from city Parks and Recreation and the Northgate Park Neighborhood Association both suggest the structure was built in the 1930s for use as a park ranger residence. The museum's website notes that its first iteration was established in 1946 by a "group of dedicated volunteers." The museum seems to have begun with a particular focus on the natural sciences, and quickly established a small collection of fossils and, it seems, taxiderm-ized animals. It seems that the museum quickly outgrew its original location, and moved that same year to the former Hester House on Georgia Avenue, where it stayed until 1961 - when it moved back to the Northgate Park area, to its current home as the Museum of Life and Science on Murray Avenue. I was delighted to discover that the original building is still standing in Northgate Park - I don't know what it's currently used for. Seems like it could be a great small community center for the neighborhood. After several cycles of flooding and proposals for adapting the space for new use or moving the building out of harm's way (apparently complicated by the heavy stonework around the wooden frame) the decision was made to "deconstruct" Lavender House. The Durham Voice reported plans to make the demolition a kind of community art project in April 2014 - any photos from that effort would be a great addition! As noted in comments below, wooden part of the structure was pulled down in the summer of 2014, with the stone chimney and other elements intentionally left in memoriam. It seems to have taken a while for the cleanup of the foundation and its transformation into its current, more manicured form. Work was finally completed in late 2017, and the neighborhood held a rededication ceremony in April 2018 once the site was safer for kids to climb on. This building was the subject of a What's It Wednesday?! post on Open Durham's social media accounts (Facebook and Instagram), the week of March 6, 2019. Follow us and stay tuned for more finds!